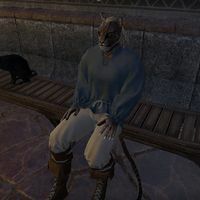 Mikarash is a Khajiit crafter who can be found in the Saint Olms Waistworks in Vivec City. He sits in the hallway outside the Brewers and Fishmongers Hall next to two cats. Mikarash has no unique dialogue. This page was last modified on 8 July 2018, at 08:21.